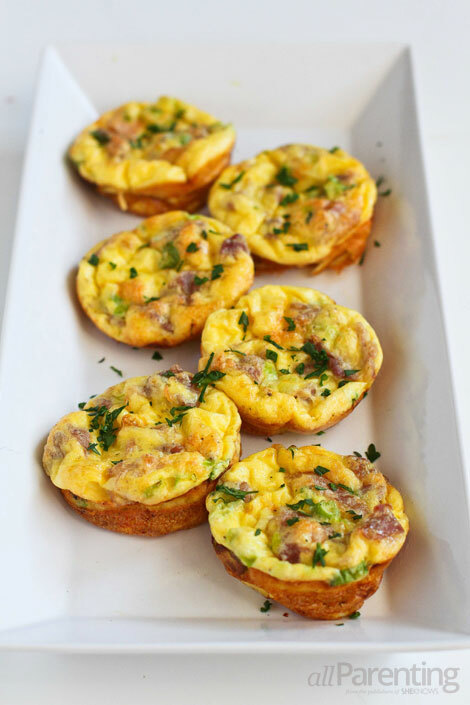 These mini frittatas, studded with salty prosciutto and Parmesan cheese, are made in muffin tins. Serve these alongside homefries and fresh fruit for brunch, or reheat the leftovers for a quick weekday breakfast. If you think your kids won't eat something that has a fancy name like "frittata," then think again. There is something about food in miniature form that makes it taste even better. A frittata is simply a cooked egg dish similar to a crustless quiche or omelet. It is typically cooked in a large skillet on the stove top, then finished in the oven. In this version, the mini versions are baked in muffin tins. Parmesan cheese and prosciutto make these into salty, savory little bites, but feel free to add in whatever fillings you have on hand. Fill them with black beans and salsa for a Southwestern flair, or even try sneaking in some broccoli or red peppers. Part of the beauty of these mini frittatas is that you can save the leftovers and reheat them for a quick weekday breakfast option. Let the frittatas cool for about 15 minutes, then store in an airtight container. Reheat them in an oven heated to 350 degrees F or toaster oven for 3 to 4 minutes. Preheat the oven to 375 degrees F. Lightly coat a 12-cup muffin tin with cooking spray. In a large measuring cup with a spout, whisk together the eggs, water, salt and pepper. In a medium bowl, toss together the prosciutto, Parmesan cheese and green onions. Divide the mixture evenly between the muffin cups. 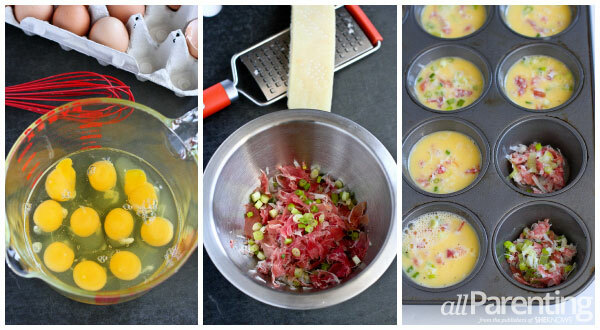 Pour the egg over the prosciutto mixture, filling each cup to no more than 3/4 full. Bake until the egg is set and the tops of the frittatas are starting to brown, 25 to 30 minutes. Run a knife or thin metal spatula around the edge of each frittata and gently lift them out. Serve immediately.